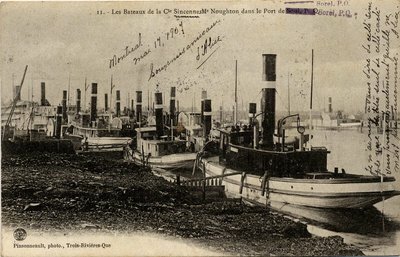 Les Bateaux de la Cie Sincennes Mcnoughton dans le Port de Sorel, P. Q. Can any of the vessels in this image be identified? Black and white postcard of the Sincennes McNaughton tug fleet and the Richelieu and Ontario Navigation Company fleets at Sorel, QU. The BERTHIER can be identified immediately behind the three decked passenger steamboat at the far right side of the image. Both fleets wintered at Sorel so this may be either a late fall or, more likely, a spring fitout image. Divided back. Postmarked Sorel, QU, 18 May 1907. "11. -- Les Bateaux de la Cie Sincess Mcnoughton dans le Port de Sorel, P. Q."